Bisque porcelain tobacco jar and cover in the form of a black head of a girl or possibly a boy, wearing a head scarf. Well painted in naturalistic colours. Tiny firing fault to edge of rim of the head. Excellent Jar. We will back this up with accurate photography. 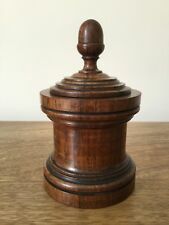 Antique Treen Storage/Tobacco Urn. A good quality, and unusual hand turned circular urn made from possibly mahogany wood. This urn is elegantly turned with circular foot, turned fitted lid and lovely curved finial. Antique Treen 19th Century Storage Jar. A good quality, English turned circular jar made from chestnut wood. Superbly detailed hand turned and carved lignum vitae tobacco jar. This rare jar is a great addition to any collection. as shown in photos. nothing major,but noted and as you can see displays very well. SUPERB ANTIQUE PEWTER TOBACCO JAR BOX CADDY HUMIDOR GEORGIAN VICTORIAN ENGRAVED !! An interesting finely crafted cast pewter metal antique tobacco jar, box , caddy, container. The jar unusually bears an early engraved decorative scene of what looks like two large bears, one is dancing, whilst the other plays a flute like musical instrument . There has also originally been engraved ladies to either side of the lid but these can now barely be seen. The tobacco jar shows superb quality craftsmanship being rectangular in shape with bevelled and shaped corners, stepped footed and shaped base and still retaining it's original lid and which bears a large detailed figural finial of a gentleman sitting on a barrel with a bottle in one hand and a flower in the other. BRASS & TORTOISESHELL NOVELTY TABLE TOBACCO BOX. We have stated 1880 - 1890,but we have had it suggested to us that it might be slightly earlier due to the naive decoration to the brass. There can be no complaints this way,so its up to you. Milk jug, made in bone china by Wade in England, modelled as a golf bag, hand painted, 9cm height. A Pierrot with a Putti over his shoulder. An antique, Victorian Staffordshire pottery tobacco jar lid. Circa 1860. Although seperated from its barrel base the lid displays well. In very good condition although there is a hairline star crack on the back as shown in photos. Constructed and of rectangular form with canted. approx 11 cms x 7.5 cms x 12.5 cms tall. 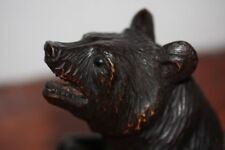 The set is carved from mutton or beef bone on a wood base & consists of the following;. Height 10cm. This listing is for a great quirky vintage ceramic humidor/tobacco jar in the form of a bust of the fictional detective Sherlock Holmes. Slipware ceramic body with hand painted colour decoration. Deer stalker hat lid has applied leather palm pad. Made in Italy 2nd half 20th century. In excellent condition with no chips or repairs. There are a few light signs of wear present to hat flaps due to past use and handling, please see photos. Lovely usable and decorative item. Weighs 992 grams. Measures 24xm high x 15cm wide x 19cm deep. Thanks for looking. In good condition with no issues on show. A small hairline on the inside of the tub - pic 5 - does not show on the outside. Better to do it now than later! Weight - 192g. A FINE ANTIQUE BRASS CASKET TOBACCO JAR BOX CADDY CANISTER GEORGIAN VICTORIAN !! Every effort is made to ensure potential buyers have as much information as possible before making a purchase, so, please do read the description thoroughly, enlarge and view each photograph with care and please take note of the measurements which are always stated , photographs can be deceiving making items appear larger or smaller than they actually are, including slight deviations in colour due to monitor settings and light. A FINE ANTIQUE BRASS CASKET TOBACCO JAR BOX CADDY CANISTER GEORGIAN VICTORIAN !! A beautiful antique hand made and cast brass casket, it's original intended use being for keeping tobacco. SUPERB ANTIQUE BRASS CASKET TOBACCO JAR BOX CADDY CANISTER GEORGIAN VICTORIAN !! Every effort is made to ensure potential buyers have as much information as possible before making a purchase, so, please do read the description thoroughly, enlarge and view each photograph with care and please take note of the measurements which are always stated , photographs can be deceiving making items appear larger or smaller than they actually are, including slight deviations in colour due to monitor settings and light. SUPERB ANTIQUE BRASS CASKET TOBACCO JAR BOX CADDY CANISTER GEORGIAN VICTORIAN !! A beautiful antique hand made and cast brass jar or casket, it's original intended use being for keeping tobacco. There is also a strange anomaly across just above the teeth, at first this looks like a repair but on closer inspection doesn't seem to be a repair at all. It almost looks as if it's replicating a sword injury or similar. BLACKAMOOR SLAVE HEAD KNOB. GEORGIAN LEAD TOBACCO JAR. INTERIOR LID DAMPER. ALL MADE FROM LEAD. 13CM HIGH (MAX). EIGHT SIDED DESIGN WITH SWAG DESIGN. GROSS WEIGHT: 1.8KG. Almost certainly continental German - this c1900 Tobacco Jar depicts six profile faces of an Angry Man. I am no Tobacco Jar expert and do not know the maker. My pictures do not do this Tobacco Jar justice! An antique ceramic tobacco jar in the shape of a Baby's Head with Dummy. Royal Doulton Tobacco Jar. Impressed with Doulton backstamp to base. Tobacco humidor jar by Royal Doulton, in a blue glaze and terracotta design. THERE IS A SMALL CHIP UNDER THE RIM OF THE HAT LID AS PER PICS. APPROX 13.5 CM TALL. APPROX 264 GRAMS. VINTAGE WOOD CARVED URN/JAR Here i have for sale a Lovely Vintage Wood Jar/Urn Its a Red/Brown wood with carvings and Lid. It measures approx 29cm tall and i think it could be a Tobacco Jar or Urn maybe? Now this is rare ! An Antique Large Royal Doulton New College, Oxford, Crested Tobacco Jar and Lid. Externally the jar is good with a small chip on rim shown in photos.. The lid inside has some damage shown in the photos. (This is quite often found on these jars as the lid would be pulled up before rotating to the correct position). Approximately 15cm tall x 15cm diameter at widest point. Cute little monkey head tobacco jar in overall very good condition. There is one small chip on the back of the lid, this could easily be colour filled to match the surrounding area and would really not be noticed. 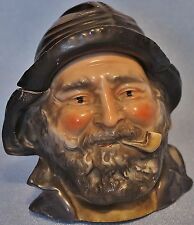 We have here a blackamoor man wearing a boater hat with light blue band, Tobacco jar antique from the 19th century. I have been told could be German. but I don't really know. Note this is not pristine.